This's Jo's block of Xmas RR we did last year. I received it after Christmas, so was very slow to work on it. But finally I've finished it before winter is coming in Southern hemisphere. 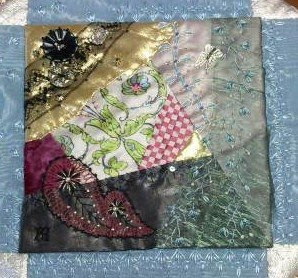 Here's the block done by Debbie Q, Leslie and Kerry before me. Then I embellished on the top part. If you compare this photo with the first one, you would see what has been added. Today is the day of drawing for my giveaway. The entries were 38 in total. Thank you very much to all for your comments on my blog and flickr site. 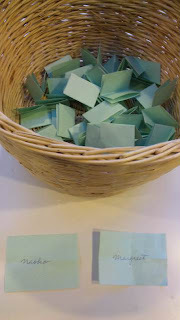 I wrote down each name on a small paper, put them together in a basket and drew two pieces. Margreet, thank you very much for your four comments! That might be a reason you've won! You had more possibilities. And Naoko, I am glad you've got one. I really appreciate a comments from Japan. Hi All, I am very happy and exciting to have got two comments from Debbie Reed for my last blog posts!! She e-maild me last year she had mis-deleted her former blog (what a misfortune!) but she would start new one soon. Finally she's come back!! Here's her new blog. Debbie, I've been waiting for you. I am so happy to hear your voice and can chatter each other again!! I've been always bringing this my favorite photo of your work on my cellular phone. I hope you don't complain if I show it here on my blog. I've embellished other two round blocks and framed them with turquize blue fabric. They might be a front and back of purse or hussif or something different. I haven't got any idea yet. 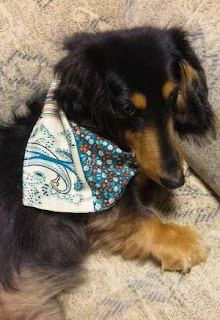 Can you see I've used left-overs of these bandanas I made for our dog a few months ago? I've found visitors to this blog is now over 100 thousands. It's a suprising number for me. I appreciate you all who are coming here. 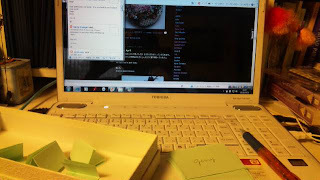 Your encouragements make me keeping this blog. Recently I've made three pinkeepers. I'll use two of them as giveaway for my readers. 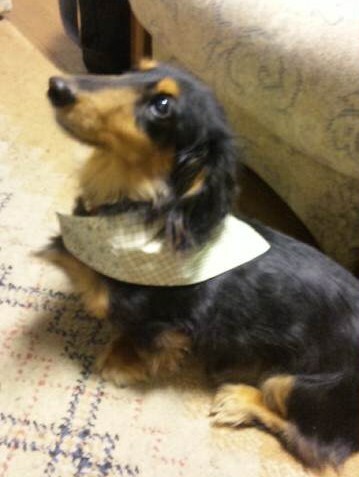 Please give me a comment to this post by April 27th. Next 28th, I'll draw two names from the list of people who give comments. I'll count the people who comment for those pinkeepers on my flickr album site too. Thank you very much for your interests in my work. These two pinkeepers are for giveaway. This last one is for myself, lol. We had snow in April today. Can you distinguish flowers from snow on this "snow willow"? I made three ATCs this month. This's the monthly one for CQI. As you see, these are made of left-over of last Ritva's AA page. I've made my April AA page for Ritva. I had seen this photo in a book and been very attracted by this vivid color combination of pink, red and purple which I might have felt uncomfortable before. But it attracted me very much then. 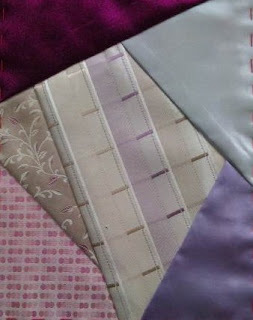 I added some solid color fabrics to tie silk fabrics Helina sent me last month. Isn't it boring? Some moving elements are required, I felt. Here's the finished block. I think my stitching technics haven't been progressed much. But I like always to challenge colors. 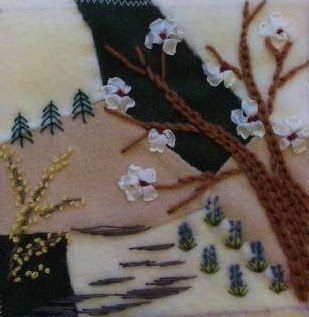 Cathy's theme is "North Woods- Seasons". First I've arranged trees like this. I easily planned to make a spring scene because it's spring now. 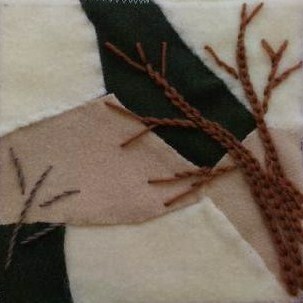 But while stitching I realized the scene was going away from "North Woods". I desperately kept stitching a bit more and stopped for a while. It had become worse. But it impossible to redo all. I made my mind to finish though it looks just like a Japanese field scene in Spring. I hope Cathy won't be disappointed with my work so much. Spring is near though we have still cold days here. Cherry blossoms will bloom in this weekend or a bit later? Jeanne, Switzland sent me a lovely AA page for April. 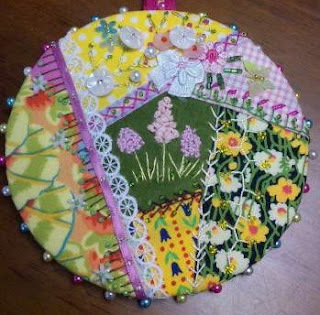 She embroidered a pretty pansy basket for happy spring. She added Charles Baudelaire 's words for me. ”Inspiration comes of working every day." Jeanne, thank you very much for your nice stitching and words!! 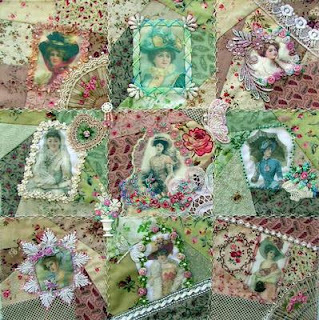 My swap partner of DYOB 4 block was Ritva and her beautiful block has arrived here. 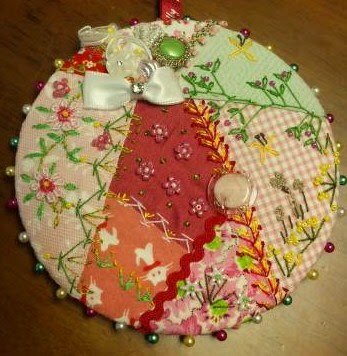 Both of the colour and stitches are so delicate, I am never tired of seeing it.